Below in the middle the old, iron tombstone dated 1606 of Anton Holmann. The photo was taken in an old small chapel on the cemetary in Mengeringhausen. On both sides of the photo (enlarged) the images of the arms of Anton Holmann and "C.H.". The meaning of "C.H." could be the initials of his wife Katharina (Catharina) Herdes. Suspected is that the mother of Arnold Langemann (Macrander) is a sister of Catharina Herdes, so a sister-in-law of Anton Holmann. "In black a golden, faced crescent from which three outcoming clover leaves. On the helmet with black-gold mantling, a repeat of the image of the shield." Anton Holmann was an uncle of Arnold Langemann (Macrander) and was Kanzler (Chancellor) and member of the "Vormundschafliche Regierung" (interim government) of Waldeck-Eisenberg, due to the death of Count Franz III of Waldeck-Eisenberg in 1597. Below several seals and housmarks of the Rafflenboel (Nicolai) family, from the armorial book "Waldeckische Wappen", part 3. The seal and housmarks are a rough copy of the originals. 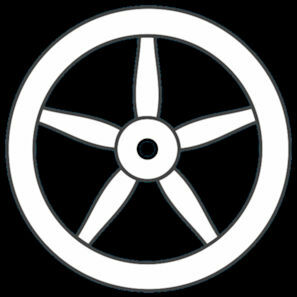 The possible colours are unknown. Jeremias Nicolai used this seal in 1559 in Mengeringhausen, the seal of his father Dietrich (Theodoricus)Rafflenboel. 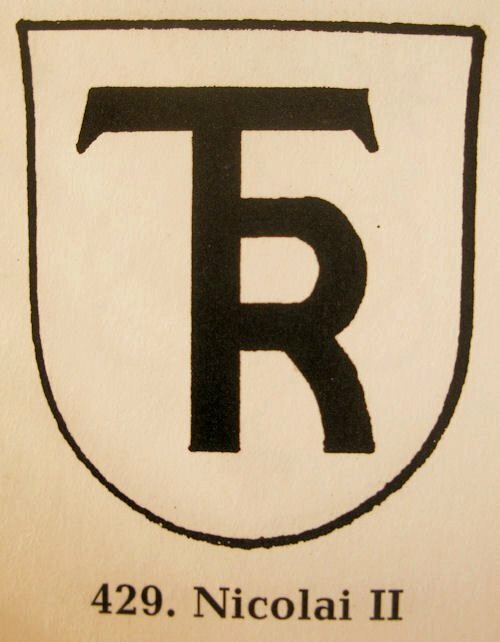 It is a monogram with the initials "T.R." (Theodor Rafflenboel). Founder of the Nicolai family was Nicolaus Rafflenboel of the farmstead "Rafflenboel", close to the city of Hagen (Nordrhein-Westfalen). His son Dietrich converted in 1543 reformism (protestantism) and was expelled in 1550. He arrived in Mengeringhausen in 1552 as a preacher, where he also died in the year 1590. He latinized his name into Nicolai, which means son of Nicolaus. 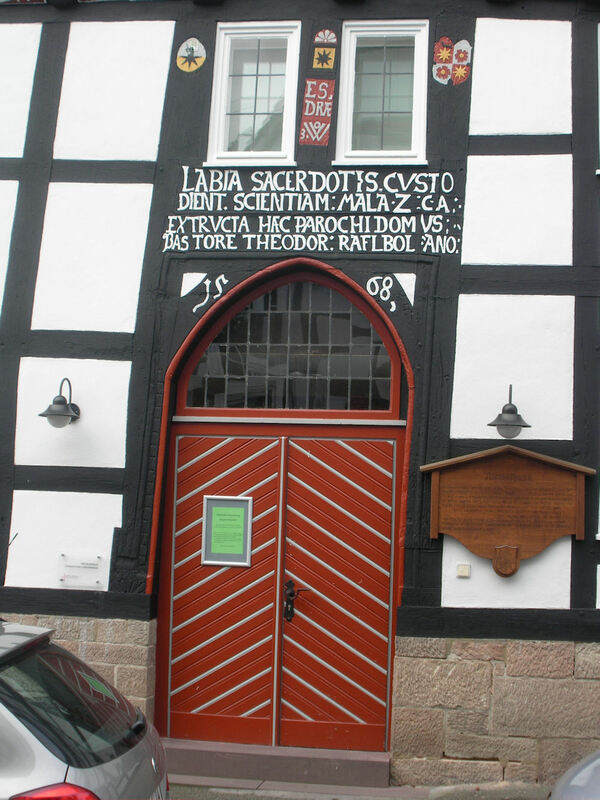 This housemark of the Rafflenboel (Nicolai) family is located above the front door of the Nicolaihouse in Mengeringhausen (see: photo) that was build in 1568, the house where Margaretha Nicolai - sister of Philipp Nicolai / the 1st wife of Arnold Langemann (Macrander) / mother of Josias Langemann (Macrander) - was raised. 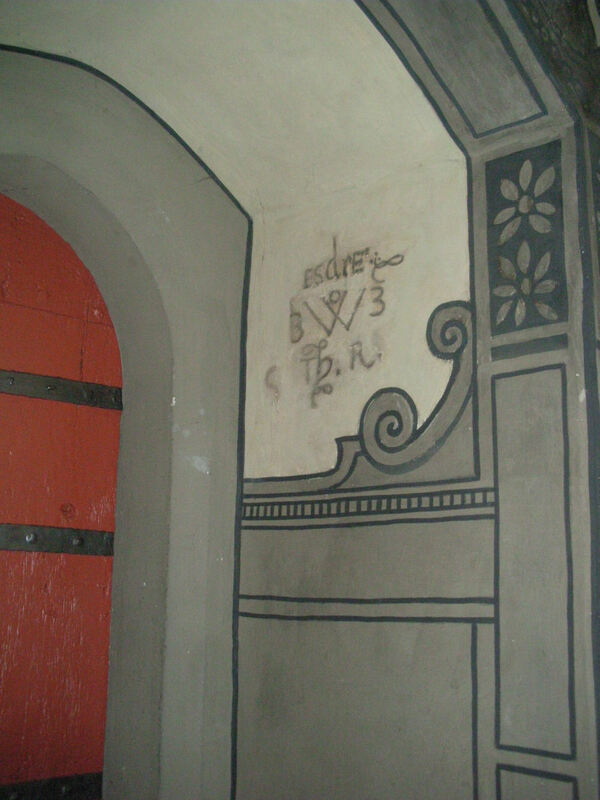 The same housemark was also rediscovered in the nearby church of Mengeringhausen, during the renovation of 1928 (see: photo). 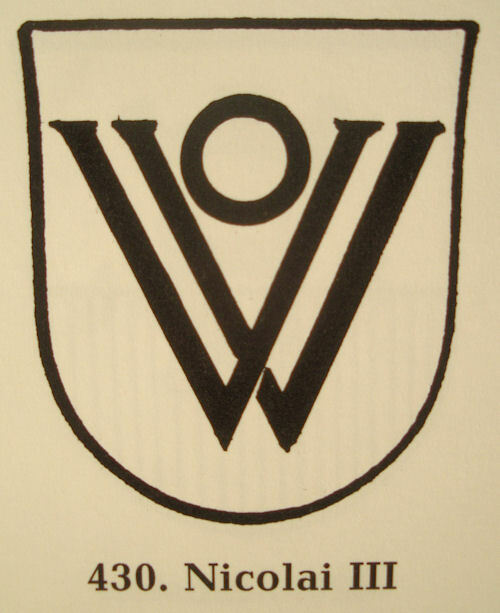 The housemark consists of the letters "V.V.O. ", which stands for "Veritas Vincit Omnia" (truth conquers all). 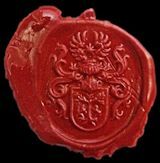 Philipp Nicolai - brother-in-law of Arnold Langemann (Macrander) / uncle of Josias Langemann (Macrander) - used this seal in the year 1582 in a letter to (then count's secretary and later Chancellor) Anton Holmann - the uncle of Arnold Langemann (Macrander). 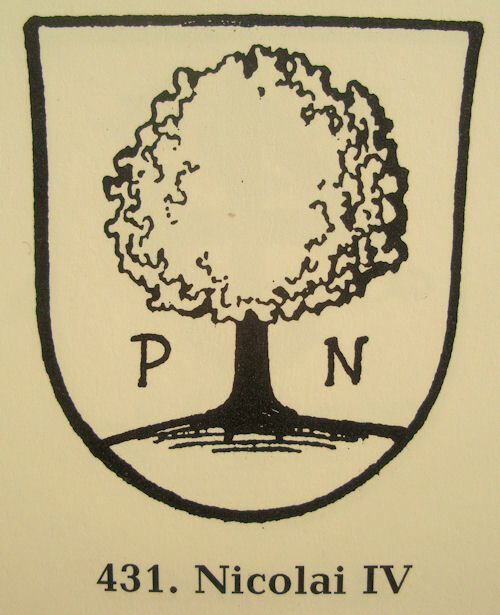 The seal represents a tree with the initials "P.N." (Philipp Nicolai). 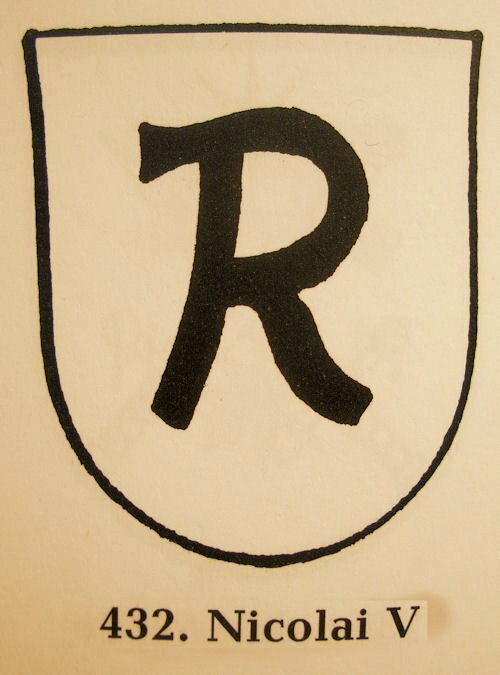 Henrich Nicolai - son of Jeremias Nicolai / cousin of Josias Langemann (Macrander) (*1590-�25) - used this seal with the "R" on 01-05-1649 in Landau, the seal of his father Jeremias.